There are a number of fun things to do through the holiday season. Carols, hot cocoa, snuggling in new PJs while watching The Polar Express. Growing up I was even lucky enough most winters to go on a real sleigh ride pulled by horses. Sometimes the sleigh would even show up, like magic, at our house, driven by Santa. I didn’t need much of a nudge to be in love with the holidays, but that certainly whispered some Christmas magic into a young girl’s ear. 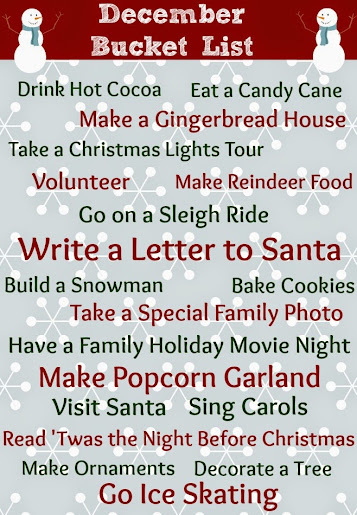 I put together a December Bucket List with suggestions to make your holidays extra-fun. Some of them might not be feasible in all parts of the country – building a snowman in Florida, for example, is a bit of a challenge. Maybe you could make a sandman on the beach instead! Whatever you choose to cross off from the list, the main point of this type of bucket list is just to have a good time and make some memories with your families. Click the image above for a printable version. What items are on your personal December bucket list? I’d love to hear what traditions you and your family share.